Mutant listens to you, our Mutant Nation of loyal fans. A growing number of you have raved about our Mutant BCAA powder (Mutant BCAA 9.7) and many of you demanded an even more convenient delivery method – so here it is, all new Mutant BCAA Caps. Throw a bottle in your gym bag and you’ll never have to worry about missing your BCAA dose when you’re on the go. 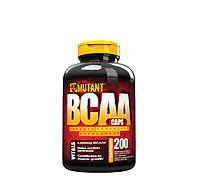 Mutant BCAA Caps deliver 2000mg of 100% free form BCAAs per dose in the preferred 2:1:1 ratio. 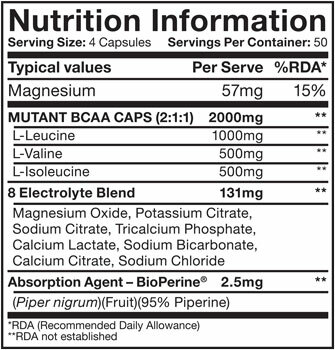 Plus we’ve kept intact the vital mineral electrolytes and the patented absorption agent BioperineÂ® that we also use in our Mutant BCAA 9.7 powder.